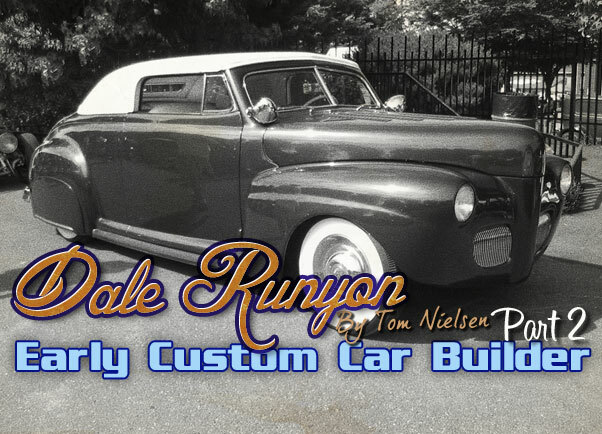 In this second part of the Dale Runyon story we concentrate on two of Dale’s fine custom Convertibles, of which one survived. By Tom Nielsen. Dale’s 1941 Ford shortly after it was finished. Note that side trim has been filled and the fender trim remains on the car. 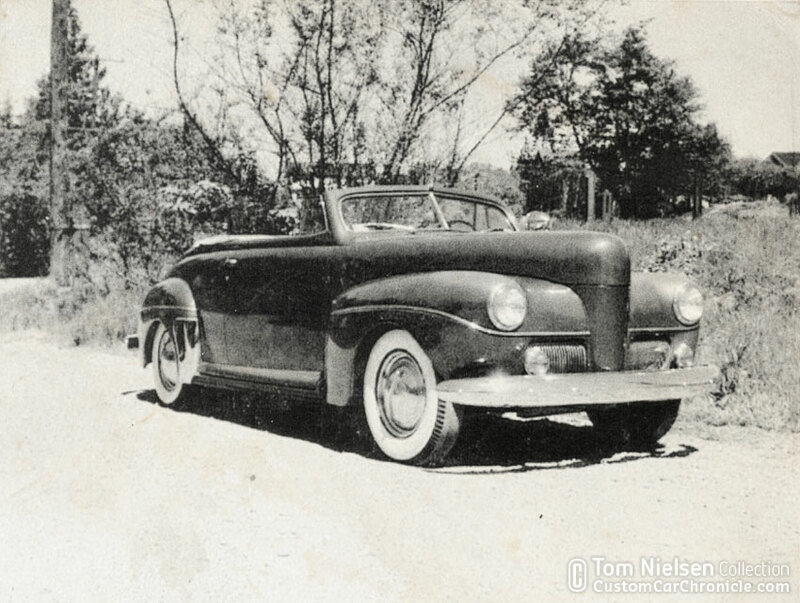 1941 Ford convertible: This car was stock when he purchased it and began to work on it in 1946. Dale Runyon was working at a local auto body shop run by a man named Les Logge, who had learned his trade in California. Dale said that Les was a master with a lead paddle and knew all about customizing. He chopped the windshield on Dale’s ’41 and completed much of the other custom work. Dale helped to make many modifications to the body while working at Les’ shop. The grille center was blanked off with a handmade piece of sheet metal that a bodyman working at the Hudson dealership made. 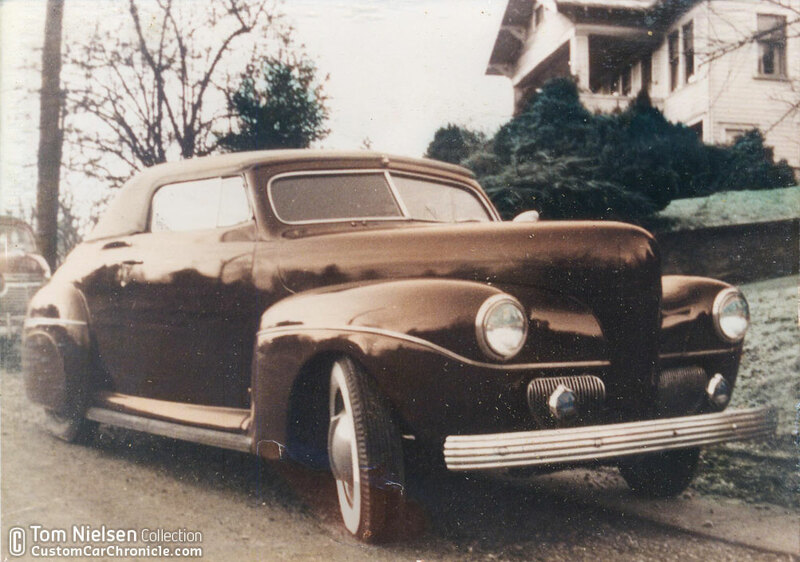 After the modifications were completed he added a pair of ’37 De Soto bumpers, fog lights, Appleton spotlight, lowered it and put fender skirts on to complete the “look”. A Seattle shop put a reddish- brown enamel paint job on his pride and joy. The padded-top was custom made at a shop in Seattle for $350. Dale and his friends had a lot of fun in this cool custom and he even drove it to Portland, Oregon several times to attend the roadster races. In 1946 this car must have attracted quite a bit of attention wherever Dale’s drove it. Some time later Dale added Chevy bumpers to the Ford. While working at Les’ shop a fellow named Joe Pierra came in with a 1941 Mercury convertible and wanted it chopped just like Dale’s ’41 Ford. It was also a nearly new car at that time, but Joe wanted to go the “full custom” route on it. Before the work got very far on the Merc, Joe offered a trade plus cash deal to Dale. The ’41 Merc then became Dale’s next project. 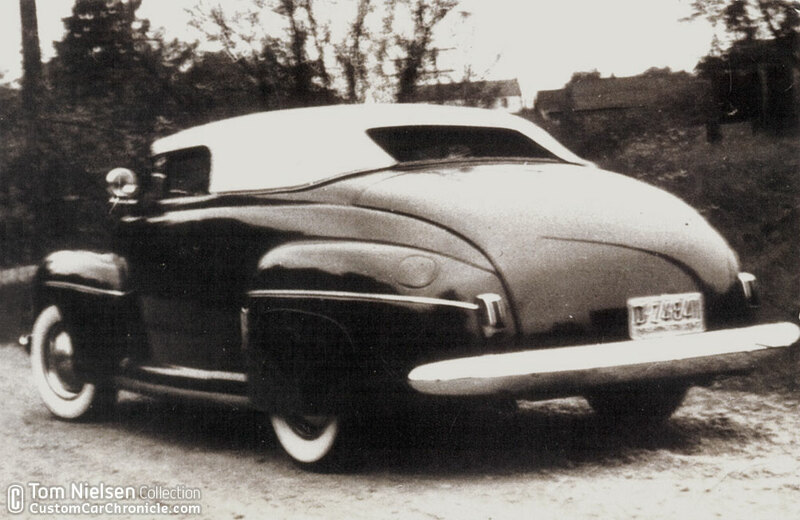 1941 Mercury convertible: Dale and Les continued the custom work on his newly acquired ’41 Merc right. When they talked about taking the fender trim off Les said they should pound the crease out of the rear fenders. He taught Dale how to use body file and set him to work. The front fenders were two pieces, so they were welded together and filled with lead. 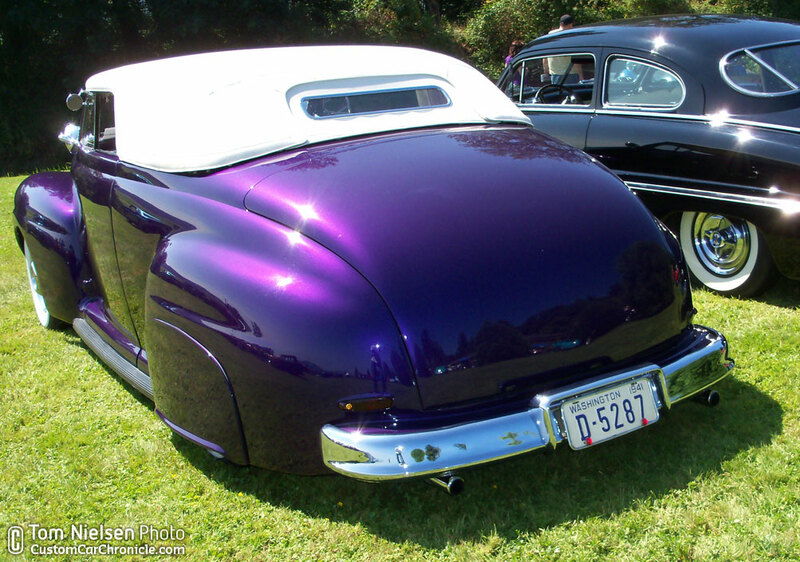 A padded-top was again made in Seattle, but this time the car was painted at Les’ shop. 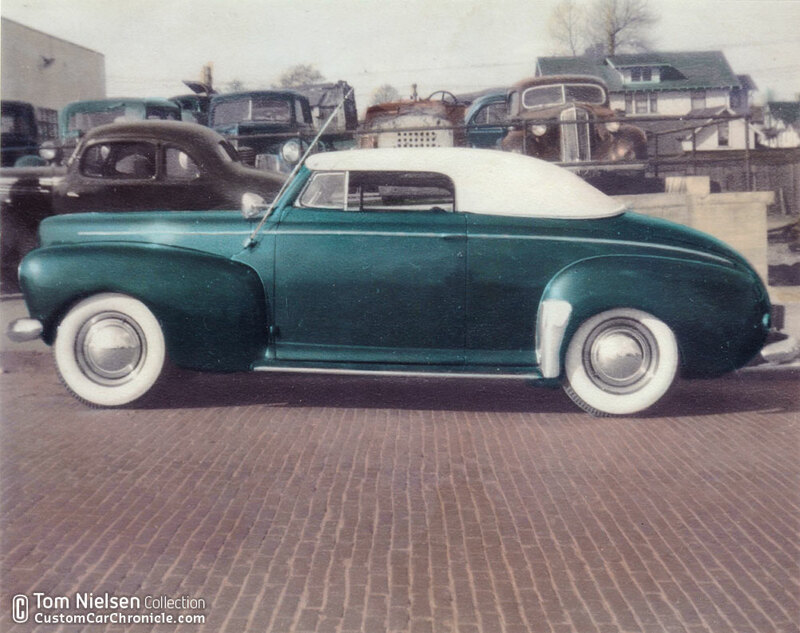 A new Dodge color in the 40’s called “Gypsy Green” was chosen to finish off the exterior. Dale’s ’41 Mercury shortly after he finished the modifications but still wearing its original paint. There was a chrome plating shop next to the body shop and Dale would work there part time too. This enabled him to chrome parts for the Mercury in his spare time. The ’47 Chevy bumpers, dashboard, heater doors, garnish moldings and other pieces that Dale chromed really helped make his car shine! Once again after driving the car for a while and garnering lots of attention in town, someone else badly wanted to buy his newly finished custom. Another Everett car guy name Joe had to have the ‘41 Merc. He made Dale an offer of $1700! That was an offer that he couldn’t refuse and so he sold it in 1949. Hand colorized photo of the 1941 Mercury. This photo shows the fenders with the crease removed. During the 1950’s Dale was busy with work and family life so he put his car activities on hold. He did buy a brand new ’57 Mercury Turnpike Cruiser which he told me was a very fun car to own. The cars that Dale had so carefully built and owned disappeared from Everett several years after he sold them. 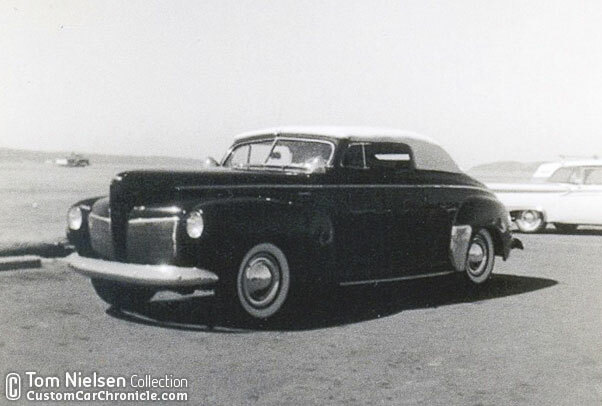 One exception was the 1941 Mercury convertible which became a well-known Everett custom. It passed through about six owners who enjoyed it and changed it very little from Dale’s vision. In 1960 I purchased it and by then the car had beautiful maroon paint, custom interior installed about 1954, and a Cadillac engine. The 1941 Ford on the other hand disappeared from Everett around 1952, but luckily it stayed in the Pacific Northwest! 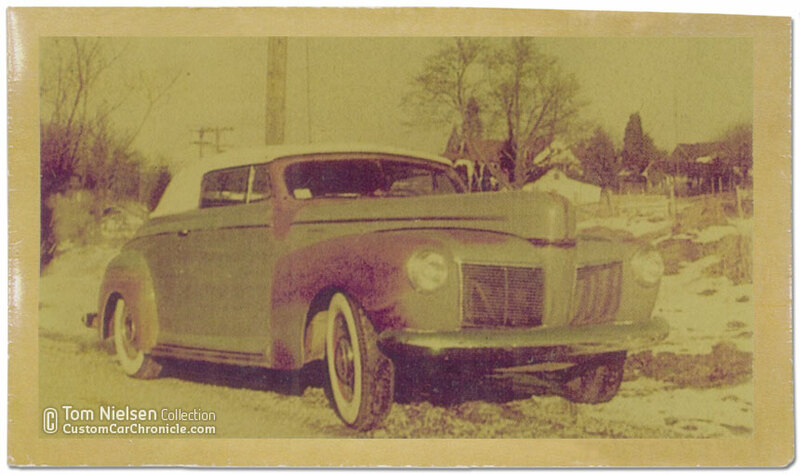 Long time Washington custom enthusiast, Paul Harper, found the convertible in 1980 near Olympia, Washington. It was in a badly neglected state and the running gear was all changed, but the body was still good. For many years Paul didn’t know the origin of his convertible until I sent him a picture of it around ten years ago from Dale’s photograph collection. At that time Paul had just finished having the convertible painted and was putting it back together. During the restoration he was careful to keep the early, traditional look to the car. I was able to set up a time when Dale and I could drive over to Roslyn, Washington so Dale could see his old convert. It was nice to see Dale light up when we stepped into the garage and he saw the chopped ’41 Ford that he had built many years ago. The clincher that positively identified the car as his was the hand formed grille center piece. Dale looked at it and recognized some of the hammer marks that were put there in 1946. Dale Runyon in Paul Harper’s shop, holds up a picture of the car taken in 1947. Both Paul and I enjoyed spending the day with Dale and talking cars. When Paul finished the car several months later he took Dale and me for a ride. Going with Dale for a ride in his old car was a very special moment. 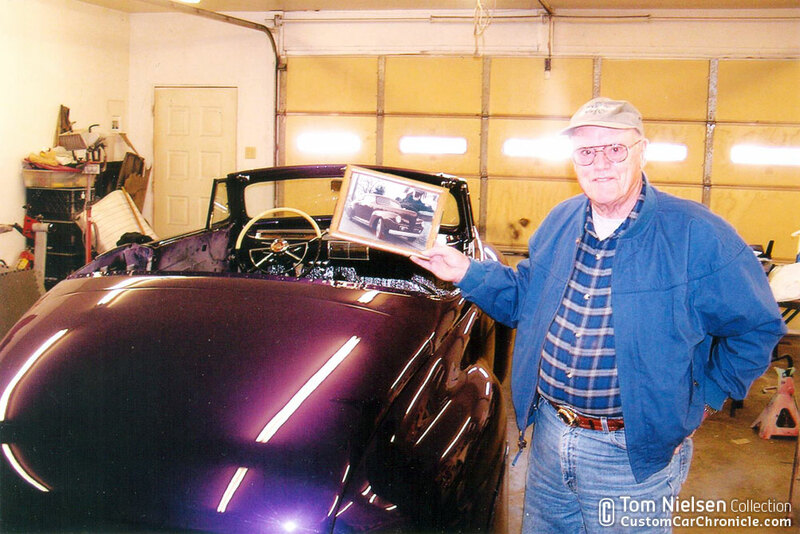 The originaI builder, Dale Runyan, was with Paul and Tom, two subsequent owners of his custom convertibles. My only wish was that I had kept his ‘41 Merc so it could have been there too! Sadly, Dale Runyon passed away in 2013 and we lost a very kind, wonderful person and a real Washington hot rod pioneer! I feel so fortunate to have known him, heard his car stories, and ultimately to have owned one of his fine custom cars. 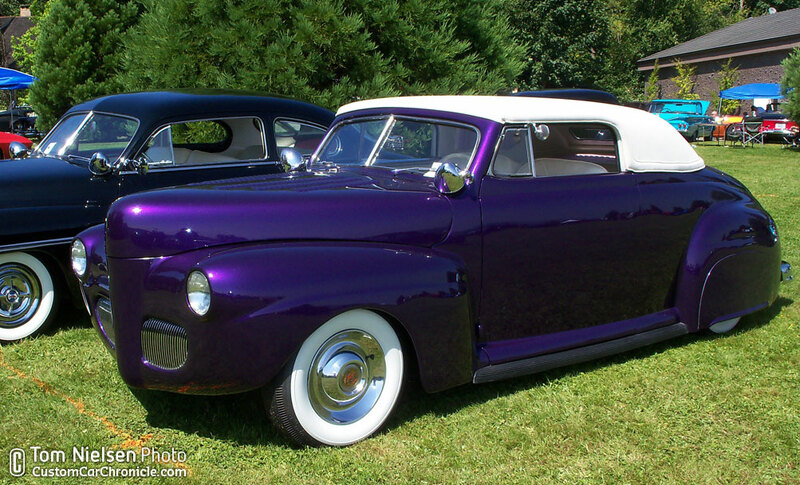 Paul Harper’s 1941 Ford convertible originally built by Dale Runyon parked next to author’s 1949 Mercury in 2012. I really like to see the different front end treatments that were used on 41 Fords. Gives me lots of ideas in regards to my own build. Great to see that the car survived mostly intact as well. On behalf of our family we would just like to thank you for taking the time to tell my dads story of his love of rebuilding cars from when he started as a kid. Restoring cars was always his first love but once he started a family and a career sad to say cars kind of took a back seat. We have shared this story with many who didn’t know that side of my dad. So again thanks Tom for letting people see that side of him. He is missed everyday! I was able to see the ’41 Ford at Paso Robles several years. It was very nicely done. Thanks for the great articles, Tom! 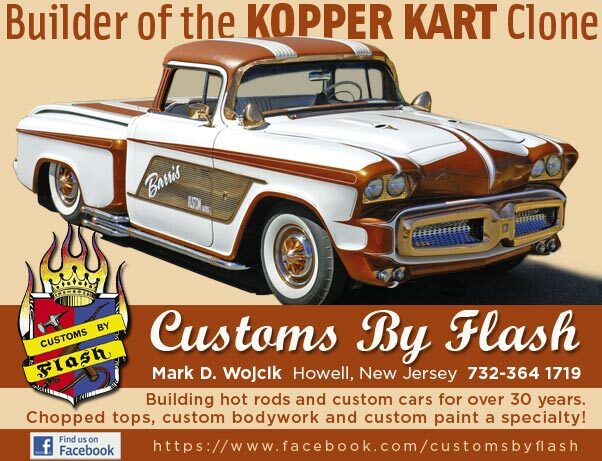 Two VERY tasty custom ’41 convertibles! Thanks Tom. Thanks Dale!